First quarter hiring averaged 225,000 positions monthly, but the rate of job additions slackened dramatically in the second quarter to an average of 75,000 positions per month as rising uncertainty caused employers to assume a more cautious stance. June’s employment figure culminated this subdued trend, and for the third year in a row, hiring slowed dramatically entering the summer months. Headwinds, including the European debt crisis and the partisan gridlock on Capitol Hill, have restrained employers, but recent headway in Europe, including the proposed creation of a centralized bailout fund, has begun to create some guarded optimism. The upcoming elections in November and, hopefully, a resolution of the tax extension debate, raise the prospect of a stronger hiring trend late this year. Private-sector employers added 84,000 workers in June, while 4,000 positions were eliminated at government agencies, leaving a net gain of 80,000 jobs for the month. On a positive note, nine of 10 private-employment sectors expanded payrolls during the month, with only the information sector shedding workers. The addition of temporary workers underpinned the creation of 47,000 professional and business services jobs during the month, while bars and restaurants added more than 15,000 employees. Manufacturing employment expanded for the ninth consecutive month, driven by the hiring of 14,000 workers in durable goods industries. Although hiring has been limited over the last three months, the broad-based nature of the additions indicates that the sluggish recovery is at least not being driven by a single engine. This offers hope that once the headwinds lighten, the U.S. economy could quickly re-engage. Reminiscent of the early stages of recovery, cautious employers have increasingly relied on temporary workers. Nearly 29 percent of the positions added in the second quarter were temporary, up from only 11 percent in the first three months of this year. 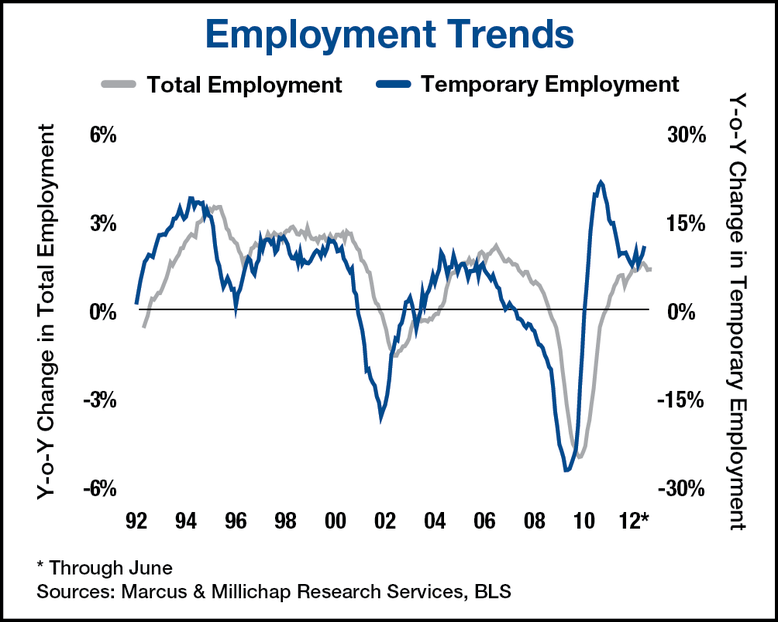 Reflecting this trend, temporary positions have reached their highest level since April 2007, constituting nearly 2 percent of total jobs. With little good news to bolster confidence and numerous fiscal decisions such as mandated government spending reductions and the pending expiration of the Bush-era tax cuts on the horizon, companies have become increasingly reluctant to commit to expansion of full-time staff. Operating conditions in the U.S. office sector continue to improve, albeit at a very gradual pace. Absorption has remained positive for six consecutive quarters, but the gains in occupied stock have not been sufficient to generate a substantive change in vacancy levels. Since peaking at 17.6 percent in late 2010, vacancy has slowly edged lower to the current level of 17.2 percent. Until companies begin adding more permanent office staff, rather than relying on temp employees, office absorption will only modestly outpace limited additions to supply. Although hiring has been limited in recent months, new rental households continue to form at a healthy pace. An additional 25,000 apartments were occupied in the second quarter, pushing the nationwide vacancy rate lower by 20 basis points to 4.7 percent, the lowest level in more than 10 years. Effective rents continue to advance, rising 1.2 percent in the second quarter. As the rate of hiring slows through the summer, however, absorption may taper off, reducing the upward pressure on rents. This entry was written by marcusmillichap, posted on July 11, 2012 at 11:40 pm, filed under Research and tagged CRE, Employment, Retail Sales. Bookmark the permalink. Follow any comments here with the RSS feed for this post. Trackbacks are closed, but you can post a comment.